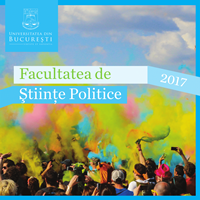 The registration and all subsequent procedures within the admission competition will be organized in the headquarters of the Faculty of Political Science at the University of Bucharest (FSPUB) from 8, Spiru Haret st. The 2017 registration for admission in the faculty's MASTER programs can be also done ONLINE by the citizens of the following states: Romania, Austria, Belgium, Bulgaria, Croatia, Cyprus, Czech Republic, Denmark, Estonia, Finland, France, Germany, Greece, Hungary, Latvia, Liechtenstein, Lithuania, Luxembourg, Iceland, Ireland, Italy, Malta, Norway, Poland, Portugal, Slovakia, Slovenia, Spain, Sweden, Switzerland, The Netherlands, UK (MORE DETAILS). Citizens of other states are kindly requested to contact directly the Office for International Relations of the University of Bucharest / Biroul de Relaţii Internaţionale al Universităţii din Bucureşti. Any Romanian or foreign citizen who holds a BACHELOR DEGREE (or equivalent) issued by a Romanian or foreign institution. Romanian citizens who graduated from bachelor degree programs and/or high schools outside Romania (or from high schools in Romania for which the end-of-studies examination is not the Romanian national Baccalaureate) will candidate under the same legal provisions like Romanian citizens with a Romanian national Baccalaureate, including for fee-paying purposes. Foreign citizens from EU, EEA or Switzerland who graduated from bachelor degree programs and/or high schools outside Romania (or from high schools in Romania for which the end-of-studies examination is not the Romanian national Baccalaureate) will candidate under the same legal provisions like Romanian citizens with a Romanian national Baccalaureate, including for fee-paying purposes.Foreign citizens who wish to enroll in a BA program taught in Romanian will add to the application portfolio a certificate which attests the Romanian-language level issued in accordance with the regulations of the Romanian Ministry of Education (CNRED). The admission competition for citizens outside EU, EEA or Switzerland is managed directly by the Office for International Relations of the University of Bucharest / Biroul de Relaţii Internaţionale al Universităţii din Bucureşti. A certificate (adeverință) that attests that one (or both) of the legal tutors of the applicant is(are) employee(s) of Bucharest University. The waiver of the application fee is awarded by the president of the Faculty’s Admission committee based on the documents provided by the candidates.